Seven Titanosaur Fossil Skeletons – Graveyard of Giants! So the story is out, we have a new contender for the title of biggest dinosaur known to science! In fact we have seven of them, for a team of researchers working at an outcrop of Cretaceous aged strata in Chubut Province (southern Argentina), have uncovered the fossilised remains of seven huge Titanosaurs and when we say huge we really mean it. These giants could well prove to be the largest terrestrial animals of all. Somebody is going to need a very big dinosaur museum to exhibit this collection. A team of researchers led by scientists from the Museo Paleontológico Egidio Feruglio (Trelew City), a museum and scientific research centre that team members at Everything Dinosaur know very well having visited and viewed the spectacular vertebrate fossil collection on numerous occasions, have uncovered a total of two hundred fossils so far from this single location. 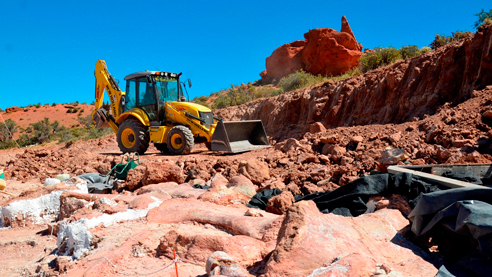 Best of all, a film crew from the BBC Natural History film unit was on hand to visit the site and record the field team at work as they carefully gathered evidence of past habitats within the dinosaur bone bed that has been nick-named the “graveyard of giants”. Up to seven individual Titanosaur remains found. This part of Argentina has produced a number of giant dinosaurs, including immense Titanosaurs, the largest of which, to be formally described is Argentinosaurus huinculensis. However, this new discovery is remarkable as there are a number of individuals to be studied and the preservation of the bone material is exceptional. This new species of Titanosaur has yet to be named. The thigh bone of one of the giant Titanosaurs. The picture above shows one of the researchers lying beside the thigh bone (femur) of one of these enormous plant-eating dinosaurs. It is a kind of a tradition amongst palaeontologists to have their picture taken lying next to the huge limb bones of these long-necked dinosaurs. Many field workers have posed for such photographs, it is probably the most practical and simple way to demonstrate the immense size of the fossils in the field. In 2011, a local farmworker contacted the MEF and reported the finding of large bones that were exposed and weathering out of the surrounding rock. Field team workers have been busy excavating the site, which is approximately 160 miles south-west of Trelew City, close to the small town of El Sombrero. About one fifth of all the fossil material has been removed and transported back to the MEF for further restoration and preparation. The size of the fossil bones made transport no easy task and the scientists were grateful for the support and advice of the Highways National Road Administration as well as the National Atomic Energy Commission which provided tools and heavy plant equipment to help with the fossil dig. Big fossils require big diggers to excavate them. The industrial plant, more at home on a construction site, certainly beat our hammers and chisels, but big diggers are required when handling fossil extraction on this scale. The strata in which the fossils have been found has been tentatively dated to around 95 million years ago (Cenomanian faunal stage of the Cretaceous). This dry and dusty part of Patagonia was very different back then, it was a lush and verdant dinosaur paradise, criss-crossed by slow flowing rivers. For this group of Titanosaurs, it may be a case of “paradise lost” as they all perished together. Amongst the huge bones, the palaeontologists have found sixty broken teeth from large Theropod dinosaurs. It seems the carcases of these animals were scavenged by some big meat-eaters. The heap of decaying corpses would have attracted every carnivorous dinosaur from miles around, after all, there would have been something like 250 – 300 tonnes of meat available for the scavengers to consume. One of the benefactors of this feast might have been the Carcharodontosaurid known as Tyrannotitan (T. chubutensis). Fossils of this twelve metre plus giant have been found in slightly older strata in the same area. The site has also yielded important data on the flora that existed in this part of the world during the Cretaceous. Amongst the fossil material excavated to date there are chunks of fossilised wood and the delicate impressions of the leaves of early flowering plants (Angiosperms). However, with the number of fossil bones found and their degree of preservation, scientists are confident that they can gather accurate data on just how big these dinosaurs were. The seven individuals represent adult animals, there are some slight differences in the size of the bones, indicating that some of the dinosaurs were bigger than others. Initial estimates of body size and mass of the largest individual, calculated by measuring the length and circumference of the femur (thigh bone) suggest an animal around eighty tonnes in weight and forty metres in length. Such figures are approximations and further work is required but the bones are on a par with those ascribed to the biggest dinosaur yet described, the mighty Argentinosaurus. Recently, Everything Dinosaur reported on a study conducted by an international team of scientists that compared how quickly dinosaurs evolved compared to birds. As part of this research, the body weights of the largest known dinosaurs were calculated. The femur size and circumference measure for Argentinosaurus gave this dinosaur a body mass of around ninety tonnes. However, the femur used was a fragmentary fossil, in this instance scientists have, for the first time, got the virtually complete super-sized Titanosaur limb bone material to work with. The giants seem to have all perished around the same time, indicating that this might represent a herd or at least a partial herd of these herbivorous dinosaurs. A spokes person from Everything Dinosaur remarked that the fossil find was indeed astonishing and that the fossils once prepared and protected against further erosion and damage would yield new information on just how big some dinosaurs could grow to. The South American research team are optimistic that these enormous fossils will eventually go on display to the public, but for the Museo Paleontológico Egidio Feruglio, this is going to cause a bit of headache. They are going to need a much bigger main gallery to display them in. New dinosaur discovery compared to a human, a giraffe and a meat-eating Theropod. The diagram above shows the new, as yet unnamed dinosaur compared to a human (yellow), a giraffe (red) and the meat-eating, Theropod dinosaur known as Tyrannotitan.